a) 1280 mm X 1080 mm X 135 mm footprint and 13 kg in weight. b) 1200 mm X 1000 mm X 135 mm footprint and 11 kg in weight. Oval nine-leg design helps deflect fork contact for longer pallet life. 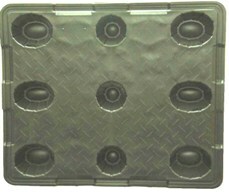 Molded-in textured deck surface for added load stability. Floor rating up to 2,000 kg - dynamic load and 3,000 kg - static load. Predominantly available in black colour.